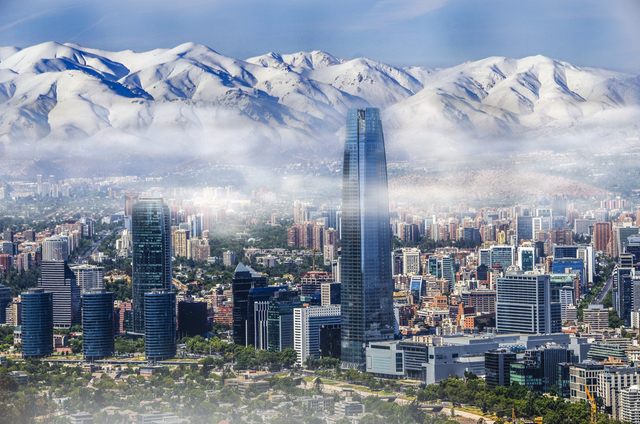 Chile is officially known as the Republic of Chile. It is collectively the longest and most narrow country in the world. The country runs along the coast of South American with the land measuring from the Pacific Ocean and the Andes mountains.Chile accounts for 292,260 square miles (756,950) of land area derived from the 2,670 miles (4,300 km) of the country stretching north and south and the narrow 217 miles (350 km) across east to west. Although disputed and suspended under the Antarctic Treaty, Chile claims approximately 480,000 square miles (1,250,000 sq. km) of Antarctica. The country is one of the most economically, socially comfortable, and prosperous nations. Chile is home to one of the 7 Wonders of South America and one of the 7 Natural Wonders of South America making it a wonder rich country. It is the world’s southernmost country that is geographically connected to mainland. What are the 7 Wonders of Chile? The Atacama Desert is located on a plateau between the Andes and the Chilean Coast Range with an elevation that prevents moisture from occurring. It is the largest desert in South America and the driest desert in the world. 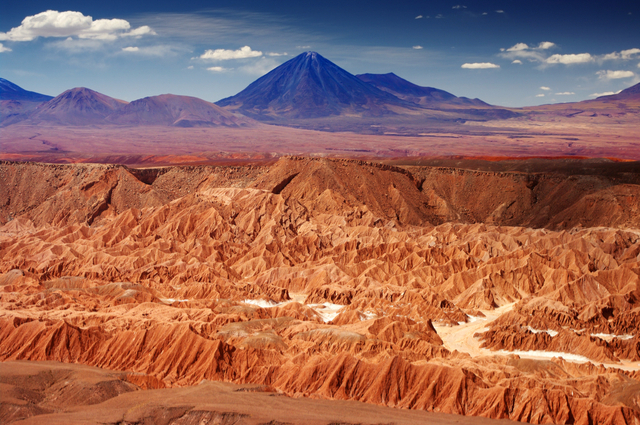 Atacama Desert stretches across a territory measuring 41,000 square miles (105,000 sq. km). The dry desert conditions continue up the slopes of the Andes and if that dry area is added into the desert area it expands to cover 49,000 square miles (128,000 sq. km). The most unique aspect of the Atacama Desert is the almost total void of any precipitation giving it the recognition is the driest nonpolar place in the world. The average rainfall is less than 0.12 inches (3 mm) a year. It is one of the 7 Natural Wonders of South America. Easter Island, although located in the Polynesian Triangle in Oceania, is a Chilean volcanic island. It is a unique wonder noted for the 887 extant monumental statues known as moai. Easter Island is considered one of the most remote and isolated inhabited islands in the world, a wonder for that fact alone. The closest neighbor is over 1,000 miles away. Easter Island measures 15.3 miles (24.6 km) long and 7.6 miles (12.3 km) at the widest point. 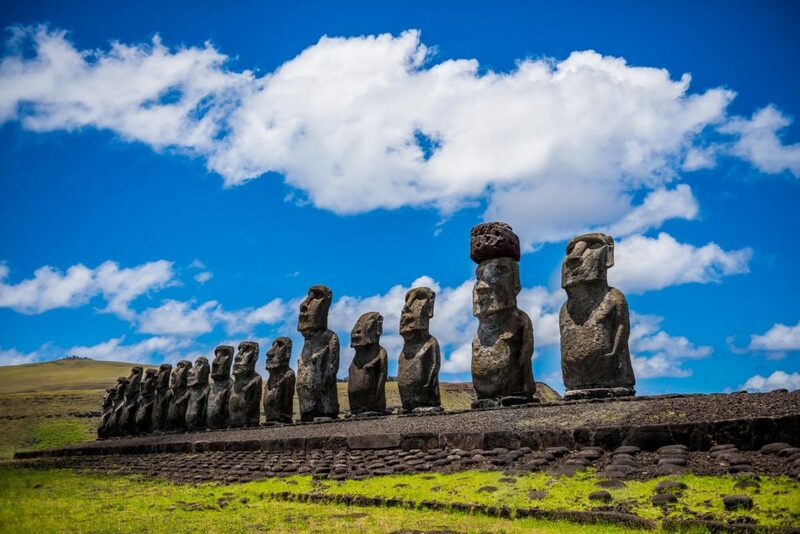 The moai statues were carved out of volcanic ash between 1100 – 1680 AD. Although often referred to as heads, they statues were created with bodies usually in a bent or kneeling position. El Tatio is a geyser field located within the Andes Mountains. It is the largest geyser field in Chili, South America, and the Southern hemisphere and the third largest in the world. El Tatio is about 14,173 feet (4,320 m) above sea level. A collection of stratovolcanoes occurring along the border of Chile and Bolivia tower over this wonder attraction. 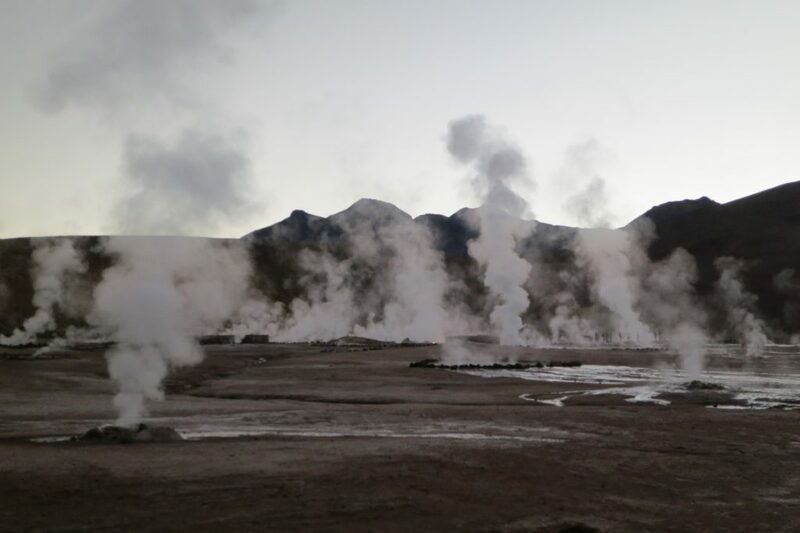 El Tatio is comprised of various geothermal features including geysers, hot springs, and sinter deposits. The vents of El Tatio are home to extremophile microorganisms. The area is a major attraction and tourist destination for the country of Chile. The chinchillas, viscachas, vicuna, and llamas are the primary wildlife located in the area. General Carrera Lake, which is also called Lake Buenos Aires, is a shared lake between Chile and its neighbor Argentina. Both names are internationally recognized. The lake is found in the Patagonia area. General Carrera Lake covers a total surface area of 714.2 (1,850 sq. km) of which the majority 374.5 square miles (970 sq. 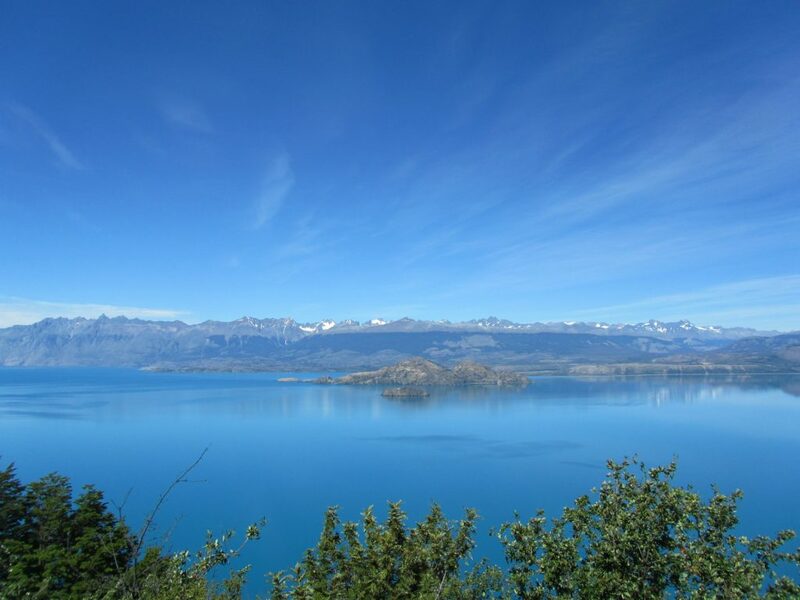 km) is on the Argentina side making it the largest lake in Chile. The lake has an average depth of 1,922 feet (586 m). General Carrera Lake features a unique geological formation in the center of the lake comprised of caverns, columns, and tunnels created by monoliths of marble. These features have the names Marble Caves, Marble Chapel, and Marble Cathedral. 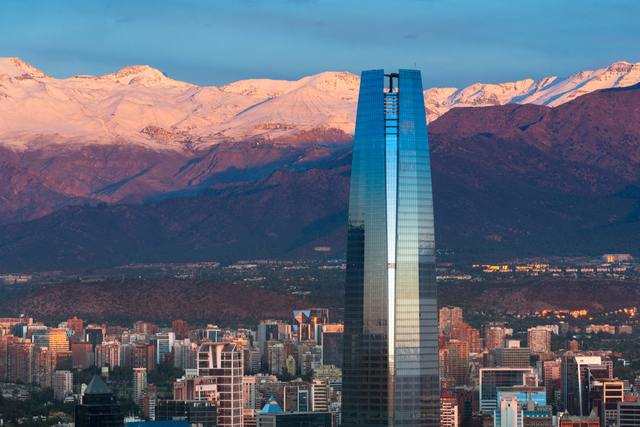 The Gran Torre Santiagom also known as the Costanera Center Torre 2 and first named Torre Gran Costanera, is a skyscraper located in Santiago. The tower was designed by Cesar Pelli who is an Argentine architect. Gran Torre Santiago is a 64-story tall skyscraper reaching a height of 984 feet (300 m) making it the tallest building in Chile, Latin America, and the second tallest in the Southern hemisphere. Gran Torre Santiago has an accumulated floor area of 1,153,083.9 square feet (107,125 sq. m) with the top floor located at 856 feet (261 m). An estimated 240,000 people will use the building daily. Sky Costanera, the observation deck, is located on floors 61 and 62 offering a 360o view of the city. 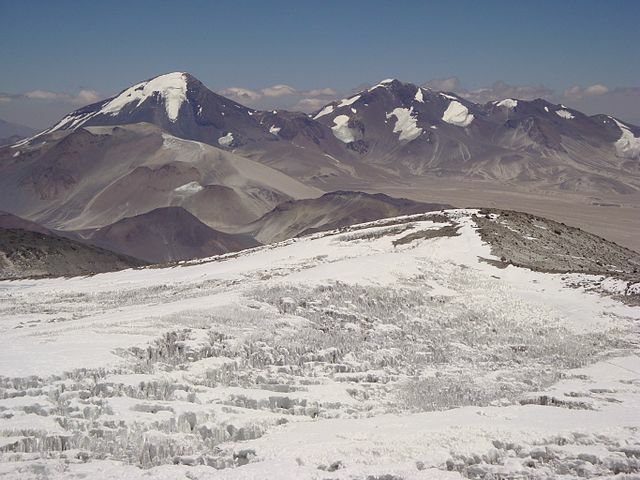 Ojos del Salado is a stratovolcano located on the border between Chile and Argentina. It is the highest mountain in Chile and the second highest in the Western and Southern hemispheres. There is a permanent crater lake located at 20,960 feet (6,390) on the eastern side of the mountain. It is hypothesized to be the highest lake of any type in the world. These collective attributes of Ojos del Salado truly make it a unique wonder and special attraction for the country of Chile.